Can anyone give me some tips on how to improve my prints on the ultimaker 2? 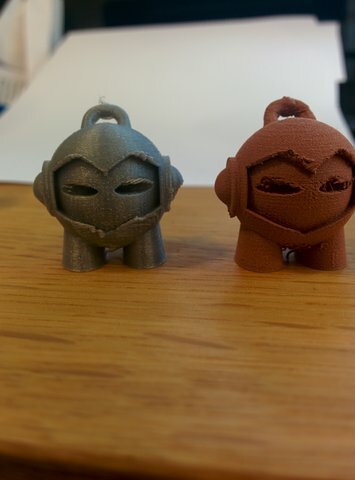 Since I bought it I have been using the Marvin model (http://www.thingiverse.com/thing:215703), and I keep getting low quality prints as shown in the picture below. 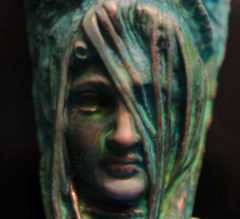 Here I’m using the colorfabb copper filament and the filament which came with the 3d printer. 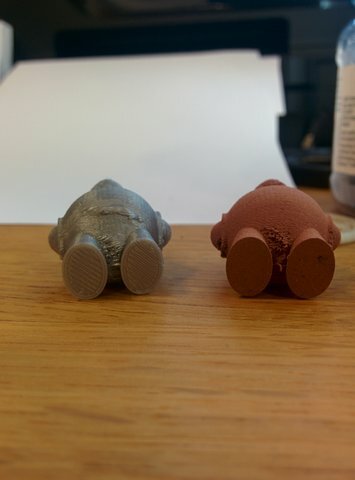 Look OK to me, if you don't have supports for the overhangs then thats what they look like no printer will do better at high resolution as you are essentially printing on thin air. Try to print in a lower resolution, make your own DIY supports, or just compensate for ANY overhangs, that is the one downside to these printers that you must learnt to live with, or specifically model things to have the overhangs working in your favour. Its also why many things you see are printed in parts or halves and not just in one go. There have been many discussions about the expectations people have when they just buy their printer and expect it to print 'anything' perfectly, when the fact of the matter is it can't print anything perfectly. There is a learning curve, but its no deal breaker, as unless you are willing to pay a lot more money then you have no choice at the moment anyways so there is no point in complaining either or people whining that they've been missold stuff. They print amazing things you just need to learn how. Post production is also a big player in the final look. P.S. if you do post-work and paint you're prints, they will ALWAYS look better than if you leave them as raw prints. Printing in fancy coloured filament for me is a waste of time as i always sand and treat my prints after, so i can spray them whatever colour i want anyways. Fancy filaments are only really useful if they are flexible or carry different properties to regular filament. But feel free to experiment, BTW they recommend different nozzles to print with the metal filament due to nozzle wear. Another reason not to bother with that stuff...unless you have an olssen block that is.